Then I received an email referencing a website I built... it was asking me to turn the site off, since the owner of the business was no longer with us. A few emails later and some phone conversations unveiled that a motorcycle buddy that I knew died in a work related accident. It was horrible to hear. I feel for the family who I visited with on Saturday. As I felt for my friend who passed, I thought it would be fitting for me to own one of his bikes. 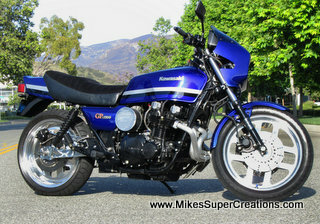 The family was nice enough to allow me to buy his last prized possession... a 1981 Kawasaki GPZ 1100 Turbo. The bike is beautiful. I really don't need another bike, in fact, I just started to sell of my bikes.... Well, time will tell.